Last week, we heard from Prof. Aimee Hosemann about her class “Food and Culture.” In this interview, we have the opportunity to hear from Clara Broomfield, a student in Hosemann’s class. Broomfield discusses the use of popular media in the classroom, and how incorporating popular media can increase students’ ability to think critically about the media they encounter daily. She also reflects on effective ways to engage students about food, making a lecture hall a more dynamic learning environment, Canvas, and the textbook Eating Culture. Lauren Renée Moore: To start with a fairly general question, what did you take away from this class? Clara Broomfield: My perspective on food has completely changed from before I took the class. I was talking to some other students, and they felt the same way. There are just so many things I wouldn’t have thought to consider when discussing food. Like, you really have to think a lot about race and language use. Also, there’s a big emotional aspect that didn’t really occur to me before. When you’re dealing with food, you really have to pay attention to the fact that you’re dealing with peoples’ livelihood and culture. It’s very emotional, and so I think taking this class really highlighted that aspect for me—which was a big revelation for me. LRM: Was there a particular assignment, lecture, or reading that really revealed that for you? CB: It was definitely cumulative, but I could feel it from the very beginning, because we had these things called commensality practicums. When we would talk, I remember… the first one, we sat down and started talking about the cookbook that we wanted to do. We were all just eating, and then everyone started to jump into this discussion… we started to share stories about our memories and our experiences with food. We worked our way around to food in the prison system and the idea of food security, and I just remember that experience was really intense, because you could tell that people were engaging on a level that was more than just academic. I think that was where I really first began to be aware of the emotional aspect. LRM: Did you feel like Prof. Hosemann guided this conversation, or was taking you to any particular point? LRM: Do you think that approach to the discussion was effective? CB: It really was. I think that was something she tried to do with most of her classes. She may have had end goals—she’s one of those sneaky people, like that. She’ll get you to go where she wants you to go. But she always was really open to letting [the students guide the discussion] and setting aside her own agenda, which I think was helpful. You never knew what was going to happen in that class. You’d walk in, and who knows what we would be talking about. Obviously there was a syllabus, we’d start there, but that wasn’t necessarily where we would end up, and it was an exciting process. LRM: You’ve taken other classes in a lecture hall format, and I wonder if this course uses that lecture hall space in a different way than other classes? CB: One thing I have not seen any of my other lecture classes do: Prof. Hosemann may be up there lecturing with the PowerPoint, but the whole time, she’s asking you questions. It’s almost like a discussion format rather than a straight lecture. You’re integrated a lot into the lecture. Everyone in the class has the opportunity to speak and say things, and if you have an idea that isn’t directly related, you’re totally okay to share that—and it may change the entire trajectory of the class. LRM: How does that impact your experience of the course? CB: I think it motivates you, because the class depends on the student interaction. You make the class what you want it to be. If you don’t come prepared, and if you haven’t done the readings, you might just sit in silence for 10 minutes and she’ll wait for someone to say something. It puts pressure on you to engage with the material, which is not something I felt at all in any of my other lecture classes. LRM: She waited for 10 minutes for someone to speak? CB: I warned my friends before they took the class: you have to do the reading. If she asks you a question and she wants you to answer it, she just waits for you. It might not be for 10 minutes, it might be for 60 seconds, but it felt like forever. Certainly long enough for someone to speak up. I always thought that was interesting…she wasn’t going to let you get away with not wanting to answer the hard questions. LRM: Do you feel like more students read in preparation for this course as compared to other courses you’ve taken? CB: Absolutely. Sometimes, we would even discuss the readings outside of class. On the other hand, I’ve had classes where I haven’t done any of the readings, because I didn’t have to. I did every single one of her readings, which is a lot. They were interesting, relevant, and enjoyable to read. LRM: Did you find the readings challenging (beyond the page length)? CB: Absolutely. They were challenging in a lot of different ways, depending on the subject matter. For example, we read this one piece, and it included transcriptions of children having discussions with their parents over dinner. I remember reading those and just getting angry reading them, and frustrated! A lot of times, the pieces she would give you would piss you off, or they drew some kind of intense emotion that you were not expecting. LRM: That was Paugh and Izquierdo’s piece. What pissed you off about it? CB: I think it was… it wasn’t just me, that was the funny thing. Several people had that reaction. It was just reading them, and seeing where the parents were screwing up and being hypocritical, and also just seeing the morality issues there… it was just frustrating to read, especially since many of us had been in that situation, and we kind of conjured up those memories of being a kid and wanting to have the lemonade but having to drink your milk, and that whole frustration. That one [reading] really got to me. I just felt for those kids. LRM: I wonder if there were any other readings that stuck out to you ask much as this one did? CB: There are so many different ones… definitely another one that we talked a lot about was the mock spanish article, it was Rusty Barrett’s article on Chalupatown, “Language Ideology and Racial Inequality: Competing Functions of Spanish in an Anglo-owned Mexican Restaurant” and working there. It stuck out to me because I have had a very similar experience, and many students expressed that as well, having similar experiences with these issues of race and language surrounding food. LRM: Can you tell me about the textbook? Many courses use the Crowther textbook Eating Culture, but I’ve never heard about it from a student perspective. CB: That’s an interesting question. I kind of went back and forth with this textbook. I’m glad that we had it, because it definitely provided a theoretical backbone, which I think was necessary and I couldn’t really get from other places. There were parts of the book that were super engaging, and there were other chapters that were just dry and dense… it depended on the section. LRM: Which sections were particularly dry, or that you felt like you could do without? CB: I think I could have done without the sections on cooking, probably. Other bits and pieces throughout as well. Part 5, “Digesting,” about food insecurity, wasn’t as interesting as it could have been. LRM: What from the textbook was great? CB: The section on eating in and eating out, for sure. Also, the section on edibility. I really enjoyed talking about “The Omnivore’s Dilemma” and our classifications of nutrition and health—I think that was really interesting. I really, really enjoyed the “Theoretical Trifle” at the beginning. The whole idea of setting a dinner party… You could use that piece alone in a class, as an introduction. LRM: You mentioned that the course made really good use of Internet resources and contemporary materials. Can you talk about that? CB: I think one of the things I enjoyed is that any time Prof. Hosemann would have a PowerPoint, it would always be filled with these memes or something off the internet that was ridiculous but that fit really nicely with what we were talking about. I remember that, in the beginning, we were talking about different dietary practices. We were going over some of the fit-spo or pro-ana (pro-anorexia) stuff, she had interesting memes about thigh gaps and things I was so used to seeing on the Internet, but had never really looked at with a critical eye. I really enjoyed that she pulled that stuff out. But also, throughout the class, students would send in links or things from the Internet, and she would then share it with the rest of the class. I remember her sharing this parody video of what happens when two stereotypical white hipsters go to an Asian food restaurant and try to order food, and I just thought it was hilarious. She took the things we saw on the Internet, and she used them as course material, which I think was a really interesting way to talk about food. LRM: This particular video, for example, how would she use that video? CB: She would play these things in class, and we would talk about how we felt, and she would relate it back to the concepts that we were going over in class. I also remember her using one of Amy Schumer’s video’s, the “I’m so Bad” video. It was when we were talking about fat talk, and the ideas of health, and how food played in with gender. She played that video, and said, “Okay—what do you think about that?” We started a discussion about how we felt about that video, what we saw in it, the things we saw it was playing off of in society. She would frequently do things like that—find these little clips and bits on the internet, or memes or quotes, and throw them out there for, “Well, what do you have to say about this?” I think it was enjoyable because it was totally unpredictable. LRM: Do you feel like this helped you look at things on the Internet more critically? Another example, she brought in this quote that I’d actually seen on my Twitter feed. 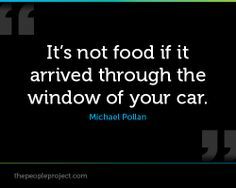 It said, “If it comes through a car window, it’s not food.” Well, that showed up on her presentation the next class. Before, I would of thought, “hey, yeah, I kind of agree with that.” But now, I see classist undertones. So it’s completely changed my mindset. LRM: Tell me about the commensality practicum. CB: The basic premise is that, instead of her standing up there to lecture, we all eat together. A lot of class is about what happens socially when food is involved, so I think it was important to play that out in terms of our classroom environment. It definitely changed the whole atmosphere in class when people ate and shared food with one another. It created bonding moments, and gave you the opportunity to have a more free-flowing conversation, so I think those were some of the best days we had in class. For one of the practicums, we decided that everyone would bring in the recipe they were making from the class cookbook to try them out. We had this big eating fest, and had the weirdest combinations of food—we had everything from pancakes to roasted silkworm larvae to borscht. That day was so successful that the next week we decided to throw a class brunch. People dressed up, and brought breakfast foods, and one of the students who has a gluten free artisan waffle-making business made waffles for us. We had A Year in Burgundy playing in the background, and we were all sitting around eating. We became a kind of tight-knit group, and it all centered on eating one another’s food. LRM: Did Prof. Hosemann have any day-to-day practices that were particularly effective? CB: She definitely comes in with a plan, and she tries to put on a little bit of a performance for you. She uses really interesting narrative strategies to get people to engage. She may tell us a personal story, but she may tell it in a very specific way, highlighting certain aspects to spark a specific conversation. You would have no idea that she was doing it unless you went back and talked to her about it, so I think that was interesting. She would always sneak around and use these strategies to get people to discuss things that maybe they wouldn’t want to discuss before. Also, she made sure the whole semester to include us in her practices. She would ask for our opinions on how she was teaching. For instance, and she would ask us, “do you [students] think that professors have ethical responsibility in dealing with food?” That then plays into how she teaches. She made herself vulnerable, I think, when talking about food. She kind of let her guard down and let that difference in status level between student and professor drop. She sort of said, “we’re all in this think-tank together.” That was an interesting way to do it, rather than feeling like someone was talking at us, or food evangelizing. She made sure to… I don’t know how to explain it, but she made sure not to force opinions on us, which I liked. She never forces views on anyone, which is kind of different than some of my other professors. She made it seem like, “hey, this is how I feel about it… how do you feel about it? Maybe that will change how I feel about it.” It was an interesting dynamic. LRM: Do you feel like that’s an effective way to approach students? CB: I think it’s much more effective than other modes of teaching because it puts responsibility for learning on the student. Especially at larger universities and in larger classes, people tend to check out and not really actively learn. By doing that, she made the class more engaging, more bearable, more interesting… it sort of reflected back on you. If you didn’t understand something, you had a lot to do with it—it wasn’t just because she didn’t explain it well. LRM: I know that this course uses Canvas, and I wonder if you could offer a student’s view on positive or negative ways of using Canvas in a course? CB: Most of my classes are very Canvas-heavy, which I think is helpful. I like being able to submit papers and get responses back on Canvas, and you have a lot of access to your classmates through Canvas. I think that aspect of it needs to be utilized more. LRM: Have you had classes that have facilitated or required student interaction (with one another) on Canvas? CB: None of them have required it, though I think that’s a really great idea. More professors should do that. I don’t think a lot of people are aware of the functions of Canvas. In this class, other students would open up discussions or share links—but a lot of that interaction happened outside of Canvas, too. We actually created a Facebook group, which happens in a lot of other classes. That interaction is happening; it’s just not through Canvas. For many of my other classes, particularly my freshmen intro classes, a lot of them have Facebook groups. I don’t know if other universities use Facebook, but I think it’s common to have some kind of online group-making experience for classes at many different universities. LRM: What did you think about the cookbook as a component of the course? CB: That was one of my absolute favorite things that we did, and I think a lot of students would agree. We get this cool cookbook that we can utilize forever, but we also get to read these recipes, stories, pictures, and anecdotes… I think it’s something she should definitely keep if she were to do this class in the future. It was awesome. LRM: What did you contribute? CB: I ended up submitting… I have a family cookbook from about 20 years ago, that my grandmother put together with an introduction. So I submitted my all-time favorite chocolate cake recipe from that book, and included my grandmother’s introduction. Then, for kicks, I submitted a funny recipe: my family’s smothered squirrel recipe. I included family jokes and anecdotes with that. It’s a real recipe, but we don’t really eat it in my generation. LRM: Is there anything you would add, or any suggestions you might have for others who are teaching food courses? CB: For others, I think I would say: they should not make it about their opinions on food. Because I remember we even talked about a professor who used her class to spread veganism. We all came to the consensus that it’s not okay. Many of us felt that, if you’re teaching a food class, it’s important to be very open-minded, and to let the students also express opinions. And then, the other thing I would say is that, even when you’re not teaching a food-specific class, you can use food and food issues in other classes. Another university in Austin is using food issues as the set-up for their composition classes. Whenever they have to write, they’ll write them on food issues. You don’t necessarily have to be teaching a food-specific course to talk about food. I think food needs to be integrated into larger contexts, because it’s so important but unfortunately gets ignored a lot in the academic sphere.